Over the course of nearly six decades, William Eggleston—often referred to as the “father of color photography”—has established a singular pictorial style that deftly combines vernacular subject matter with an innate and sophisticated understanding of color, form, and composition. Eggleston has said, “I am at war with the obvious.” His photographs transform the ordinary into distinctive, poetic images that eschew fixed meaning. 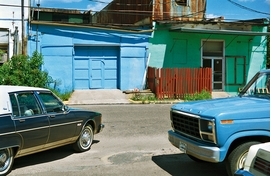 Though criticized at the time, his now legendary 1976 solo exhibition, organized by the visionary curator John Szarkowski at The Museum of Modern Art, New York—the first presentation of color photography at the museum—heralded an important moment in the medium’s acceptance within the art-historical canon and solidified Eggleston’s position in the pantheon of the greats alongside Henri Cartier-Bresson, Robert Frank, and Walker Evans. Featuring original scholarship by Alexander Nemerov, this notable presentation of The Democratic Forest provides historical context for a monumental body of work, while offering newcomers a foothold in Eggleston’s photographic practice.